Paul Fletcher made his major league debut in 1993, in Philadelphia for the Phillies. It was Fletcher's sixth season as a pro. Years later, Fletcher tried to relay to The Jackson Herald the feeling of the moment. "It was a feeling I can't describe," Fletcher told The Herald in 2012. "Curt Schilling had started the game. The energy of 42,000 fans is pretty amazing." That outing ended up being Fletcher's only major league outing of 1993. Fletcher, though, returned to the majors two seasons later, ending up seeing playing time in three total major league campaigns. Fletcher's career began in 1988, taken by the Phillies in the 40th round of the draft, out of West Virginia State. Fletcher started with the Phillies at rookie Martinsville, going 1-3 in 14 starts. He made single-A Spartanburg in 1990, then AA Reading in 1991. He got his first brief look at AAA Scranton in 1992. 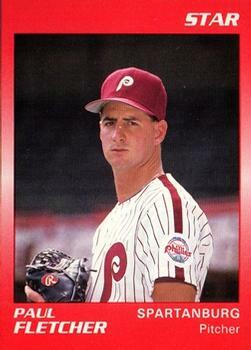 Working full time at Scranton for 1993, Fletcher also got his brief, one-outing debut with Philadelphia. Fletcher ended up getting just one out in that July appearance, his only one in the majors that year. For 1994, it was back to Scranton for the season. In late May, Fletcher pitched a complete-game shutout, breaking a personal losing streak, all in front of his family, according to The Wilkes-Barre Times-Leader. "I kind of guess they're my good luck charm," Fletcher told The Times-Leader after the game. Fletcher didn't see Philadelphia that year. He didn't return until August of the next year, 1995. That July, Fletcher was riding a run of 24 appearances where he gave up just four earned runs, according to The Times-Leader. "He's pitching now the way he pitched the last four, five weeks of the year last year," Scranton manager Mike Quade told The Times-Leader. "The key for him is to maintain that for the rest of the year." For Fletcher, it got him back to the majors. By Aug. 8, he was back with the Phillies. Over 10 appearances through the end of the year, Fletcher gave up eight earned runs in 13.1 innings of work. For 1996, Fletcher signed with the Athletics. He also got one last appearance in the majors. That August, he got into one game for Oakland, giving up three earned runs in 1.1 innings of work, finishing out his major league career. Two more seasons back at AAA and Fletcher's professional career was over with 12 total major league appearances.